Happy Campers with Happy Colors!!! We sold our "pop-up tent trailer" last weekend. Why you ask? Well...because...I am afraid of bears. Yes, there you have it, it is true! The only problem is....we love camping, but I have a solution and a plan: next year we purchase a bear proof camper/trailer and redecorate it in a cozy Norsk style. So a-cyber-surfing I went and check-out what I found for inspiration at the Madison Avenue Baby Blog. I also love, love, love the colors that Meme Rose uses...the NVO may very well put his foot down on that one though. :-( Oh well, I will find somewhere else to use her happy colors. The wheels are a churnin'. There will be lots and lots of color coordinated crocheted stuff to make...and I have a whole year to crochet a way! I am so excited I can hardly stand it. 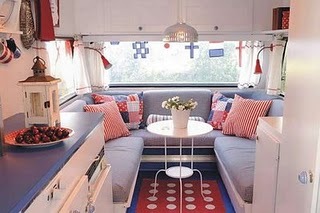 Once the camper/trailer is road worthy and those dishes are secured, I dream of traveling the entire USA for a year. (After spending 6 months in Norway, of course) Ahhhhhhhh....wouldn't it be bliss? Shoot, retirement is 9 years away for the NVO and 12 years away for me. :-( I suppose we may just have to embark on some close-to-home camping trips and a few weeks at a time in Norway in the interim, but that's not so bad, eh? We are so alike, I could totally camp also..and especially with a camper that looked that good! However, you are right about the dishes? How do they deal with that when in motion? Must pack everything down and just have it out like that when they are situated somewhere? Really lovely though, prettier then any camper I have seen here! We vacationed in Karlstad Sweden at the most lovely campsite and I have always wanted to go back and even buy a camper which is permanently stationed there...it was so peaceful! Thanks for stopping by and I hope you have a great weekend!! As a RVer I can tell you that all items have to be put away in any RV when traveling down the road. 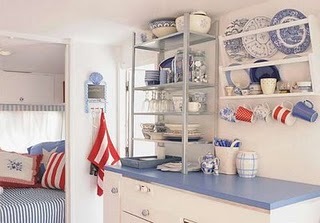 Those trailers are adorable when set up but none of those dishes would survive the roads if left out loose on those shelves and counter tops. We just downsized from a large 5th wheel travel trailer to a small travel van (Pleasure Way) and we are almost finished with packing the essentials in it. Everything has a secure place when we are moving. I would love to get a vintage camper and fix it up like the one in your post but we have a Home Owners Association with all those limitations where we live and we can't keep our RV here all the time. And to have a vintage one we would have to be able to keep it by our house to work on it. I guess I can dream about it and just drool over the ones posted. Have a lovely day!